Iacobus Kerouac, anno 1956. Photographemata a Thoma Palumbo factum. 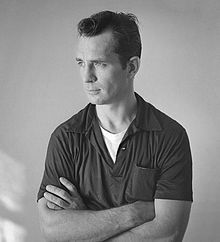 Iohannes-Ludovicus "Jack" Kerouac (natus Lowell Massachusettae die 12 Martii 1922; mortuus St. Petersburg Floridae die 21 Octobris 1969) fuit scriptor et poeta Americanus. Novissima mutatio die 31 Octobris 2015 hora 23:49 facta.